This unfinished altarpiece was originally commissioned by the monks of San Donato a Scopeto, a monastery near Florence, in March 1481. Leonardo’s father, who administered the monastery’s finances, may have played a role in obtaining the commission. The painting was left unfinished by Leonardo when he moved to Milan sometime before 1483. In this painting, Mary is seated with the Christchild in the centre of the composition in front of a rocky landscape, surrounded by a large number of figures, the identity of which remains unclear (it is uncertain which figure is Joseph). In the foreground, the three kings who followed the Star of Bethlehem on their journey from the East, kneel in worship before the Christchild. In the background we can see the ruins of King David’s palace, alluded to in the Old Testament as the ancestor and precursor of Christ, and figures on horseback engaged in violent combat. These may be a reference to the enmity that was said to exist between the three kings, or to the chaos of the world prior to the coming of Christ. Leonardo’s Adoration represents the moment when the second king offers his gift of frankincense, traditionally a symbol of the Eucharist, to the Christ-child who willingly receives it, a symbolic gesture of his acceptance of his fate. The “Adoration of the Magi” was a popular subject for altarpieces in Florence, due to the fact that the feast of the Epiphany fell on the same day as the feast day of St. John the Baptist, the city’s patron saint. Furthermore, a large lay confraternity or “Company of the Magi” of which the Medici family were members, organized a huge procession on that day. The Adoration of the Magi altarpieces painted by Gentile da Fabriano for the Strozzi Chapel in 1423 (Florence, Uffizi), and Filippo Lippi in 1455 (Washington, National Gallery of Art ) were important precedents for Leonardo’s painting. Both of these works contained a large retinue of figures of varied types and a wealth of naturalistic detail. 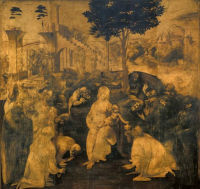 Leonardo’s Adoration of the Magi marks a turning point in the history of the representation of the human form in religious art. The complex, dynamic nature of the scene and the whirlpool of actions and gestures that swirl around the central figures of the Virgin and Child are totally innovatory. Every figure is engaged in some sort of movement, except the Virgin and the standing figures seen in the foreground at the extreme left and right, which provide control and balance for the more dramatic elements of the composition. The varied actions and expressions of the figures convey a wide range of emotional responses including awe, incredulity, devotion, contemplation and inquisitiveness, in response to the mystery of the arrival of God as man on earth. Surviving drawings suggest that Leonardo worked out every element of the composition in drawings prior to beginning the painting, although only a handful have survived.